We all know about Bunnings, they’re just about everywhere. I buy materials from them all the time because they are handy for my handyman business, I can always duck to bunnings to get what I need fairly quickly from wherever I am working. These days you need a website for your business. According to recent surveys 89% of people search for things on the internet, so I think advertising in the local rag will be a bit disappointing. I have just built my website (from youtube lessons) and I think it has turned out pretty well for a beginner. I have tried to make it user friendly and provide enough info for potential customers. I’ve found that building it is only a small part, it has to be seen in the searches, this is where SEO comes in and that is a field of its own. I’m sure I am causing myself brain damage trying to understand this stuff and wade my way around all the terms that people have come up with. I am only a small business and can’t afford to pay geeks the fees that they want, my handyman skills must now extend to graphic design and IT. I’m slowly getting the hang of it thanks to youtube and different articles on google along with quite a few calls to my hosting provider in the States…(can’t wait for my phone bill)…but some things are still a mystery. When installing new laminate benchtops it is all too easy to chip the bare edge of a join, especially if it is awkward to get into position. If this happens it can be quite difficult, if not impossible to rectify and the only way is to replace the section. If you have a match head size chip in a 3 metre long section this can be very expensive, not to mention wasteful. This is one of the downsides to installing benchtops. There are people that manufacture “repair” products such as colour crayons which are made from wax and there is also something called ‘Liquid laminate’ which comes in various colours. I have experimented with most methods but none of them restore the laminate anywhere near original, you may as well just use a matching colour of paint. If you have a matt finish and you use the wax crayons the repaired area will develop a shine from the buffing action of wiping the benches and will become very noticeable over a short period. The bottom line is that you need to be very careful handling the tops and if you chip them you need to replace them. 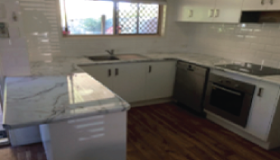 I don’t expect my customers to live with a repaired ‘chip’ when they purchase new benchtops from me. I have developed a system for minimising the risk of chipping by placing masking tape all around the exposed join and leaving it there until the last moment, peeling it off just prior to gluing and sealing the join. I’ve used this method many times now and haven’t chipped any of my installs. 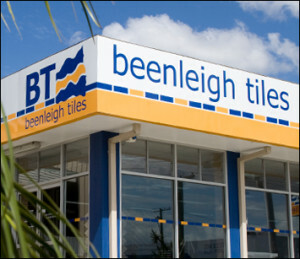 A great source of tiles and friendly advice.